As supporters point out, the eighteen Pora members who traveled to Serbia to train with the US-trained Otpor veterans paid their own way, as presumably did those who traveled to Tbilisi to learn from the Serbian-trained Kmara vets. But the bright future they planned held promised rewards of its own, and with the precedents of recent years to learn from, they had good reason to expect success. 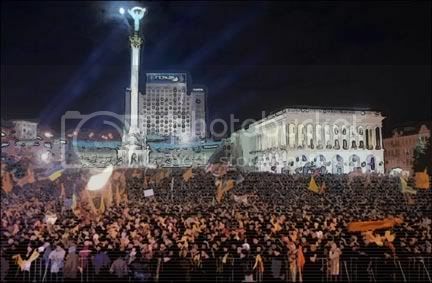 It would seem the Orange Revolution would be well worth the price of a few bus tickets. The question that remains is what the activists drew from these pilgrimages to the sites of previous civil insurgencies. Such travels would risk making the revolution appear part of the then well-known pattern of U.S. backed/engineered revolutions, but the risk was seen as worth it to learn the secrets of the trade in an unbroken chain of enlightened masters, all on NATO, NATO-occupied, or NATO-allied soil. Paul concluded that “Congress and the American taxpayers have a right to know […] how much U.S. government money was spent in Ukraine and exactly how it was spent,” and called for an investigation by the Government Accounting Office. So far there has been no such investigation. Nonetheless most of the help for the revolution was provided from native Ukrainians and the wealthy Diaspora communities banded together, donating money and needed items and volunteering time. As we’ve seen, municipal leaders like Kiev mayor Olmchenko were instrumental in allowing the protests to flourish. Others who sympathized with the movement pitched in by not doing things like cracking down. Petro Rondiak noted: “the riot cops were laughing at our jokes and I certainly doubt they would put up much resistance if...”  The authorities simply refused to clamp down on their fellow citizens and all remained peaceful. As per Sharp’s strategy the protesters did what they could to co-opt the security forces, but in this case, for whatever reasons, the main effort behind this co-option came from within the security services themselves, the final stroke of which came just in time to prevent the Orange Revolution from turning red with blood.